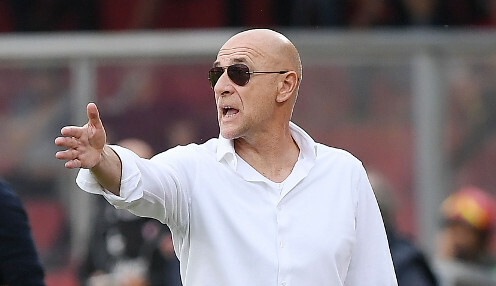 Head coach Davide Ballardini is the man in charge at Genoa this season. The 23-year-old Poland international striker has made an incredible start to life in Italian football, almost immediately sparking talk of interest from a number of major clubs. Just thinking about it (selling him) is crazy. Piatek has scored eight goals in six Serie A appearances for Il Grifone, while his overall record for Genoa following his summer arrival from Cracoiva stands at 12 goals in seven games - due to him having scored four times in a 4-0 Coppa Italia win over Lecce. However, Preziosi has vowed not to allow Piatek move on in the near future, with his club having done plenty of homework before completing a 4million euro deal which already looks like one of the bargains of the summer. He told the Italian media: "Just thinking about it (selling him) is crazy. "I'm very happy with him. We knew he possessed great qualities, he's a latent talent, but I wouldn't be telling the truth if I said 'I knew it'. "However, I'll also say that we didn't sign him on a whim, I'd seen him play. He's a striker who scored 21 goals in the Polish League last season, in all kinds of ways. He's a real talent who can explode at any moment." Inspired by Piatek, Genoa stand in sixth place in Serie A after winning four of their opening six league games. Next up is a visit from Parma next Sunday, with the hosts 8/11 to claim all three points and 14/1 to win the game 3-1, with the draw priced at 13/5.